Home > WhatsApp Tips and Tricks > How to Fix “Sorry, this media file doesn’t exist on your SD card/internal storage”? WhatsApp is one of the most popular instant messaging apps used in the world, especially in the Asian subcontinent. Its popularity can be gauged from the fact that Facebook bought it for a huge sum to cash in its user base. It allows 2 or more users to interact with each other, irrespective of where ever they are, using internet data. This interaction is not just limited to text but also audio and video calls. Users can also share photos and videos to one another. 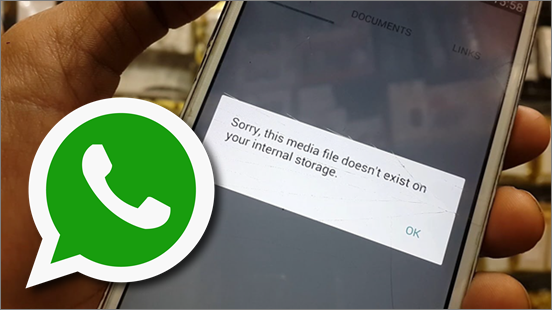 But many WhatsApp users, when sometimes accessing photo, video and other media, face the following WhatsApp media files missing problem. The image shows the exact message one receives when encountering such a problem. The files they are trying to access, are just blurred and appear to be missing for no reason. Are you one of those people who face this issue? In this post, we offer some troubleshooting steps and a reliable WhatsApp media recovery solution to help! All the media files like images and videos sent to you on your WhatsApp messenger are auto saved in Gallery under the WhatsApp folder by default. So, when ever you get the error message “Sorry, this media file doesn’t exist on your SD card/internal storage”, you should first check if you can find those files in the Gallery. If yes, it means that you might have moved them to a different folder than the default “WhatsApp” folder. To correct it, find the missing images and videos in the gallery and then, copy and paste them into the WhatsApp folder. After you have done that, try again to open those media files in WhatsApp. You will be surprised to find that the problem has been resolved successfully. Sometimes, it may happen that the file you are trying to access is either deleted or corrupted. In such cases, the WhatsApp application may show you the same error. WhatsApp backs up your messages, images and videos (optionally) on your Google Drive(on an Android smartphone) on a daily basis (frequency can be changed from the Settings). If you have accidentally deleted a photo or a video and wish to recover it, all you need to do is first uninstall the app and then reinstall it. Once you install the app, you are provided with an option to restore data from previous backups. It will redownload all the WhatsApp media files saved in the cloud backups and save them back to your device. This method is easy, quick, safe and guaranteed. However, it depends on cloud backups created previously. If you haven’t created backups of the images beforehand, you may not be able to recover them using this method. Cannot find the missing WhatsApp media files on your Android phone in step 1? This means that those files are either corrupted or deleted. For such a situation, you can try and use a special Android Data Recovery software designed specifically for such purpose. Here is a simple guide helping you to get through the steps to recover deleted WhatsApp on Android without backup file. 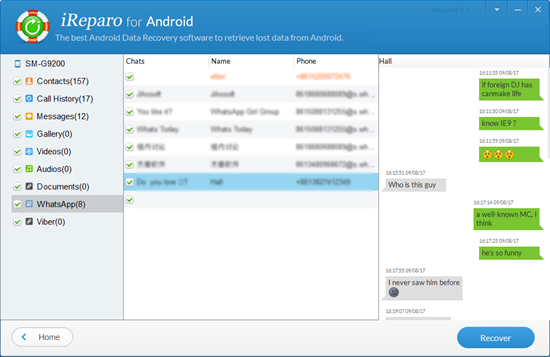 Step 1.Download and install free trial version of Jihosoft Android Data Recovery. Step 2.Connect Android device to computer with USB cable. Step 3.Set up Android device to enable USB debugging. Step 4.Run Android Data Recovery program. It will automatically detect your Android device. Simply click “Start” to scan WhatsApp messages. 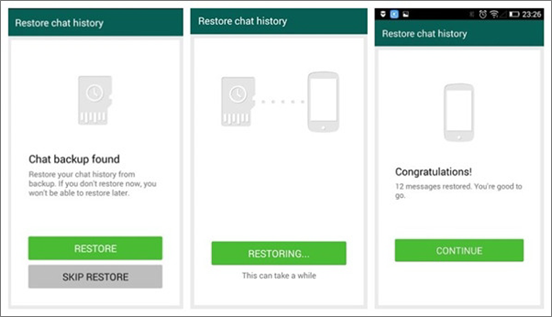 Step 5.Preview and restore deleted WhatsApp chat history. After scan completes, choose “WhatsApp Messages” and tap “Recover”. Make sure there is enough free space on your SD card to save WhatsApp media files. Ensure your SD card is not set to read-only mode, which allows you to save WhatsApp media files on the card. Make sure that your SD card is healthy and works properly. A corrupted SD card will not save any files to it. Hope this article and the mentioned solutions will help you solve this WhatsApp issue.